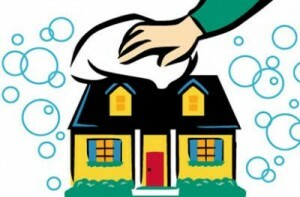 One of the most high growth industries is the home and office cleaning. Because of the low costs and minimal education requirements, there is a huge supply and demand in this business. For anyone looking to hire a professional home cleaning company, there will likely be many options available, especially if you live within urban areas. If you are finding it difficult to settle on a suitable provider, here are a few steps you can follow to narrow down to the best choice. There are many services offered by cleaning providers that can vary from whole house housekeeping services to carpet and spring-cleaning services. Some providers are very sophisticated, and even come in with their own equipment and are available at all hours of the day. Narrowing down to what particular services you want can help eliminate many of your potential candidates. Most of us have limited resources we can expend on cleaning services. Work out what would be a reasonable amount for you to spend on these services. If it is a low amount, you may have to knock off some of the tasks you would want the cleaning company to provide, or seek a newer company that is offering much lower rates. Because of the risks involved in letting in strangers into your home, it is a good idea to choose providers who are known to either friends or family. Get recommendations from those that live in your area and pick out candidates that are most frequently mentioned. You can further review those using online resources. Look them up on independent review sites. Once you narrow down to a few likely prospects, seek out quotations from each one. A walk-through is often part of the evaluation meaning you get to interact with one of the supervisors. You can tell a lot form the attitude e of the supervisors and determine how thorough they are in their work. Use this, and a comparison of the quotations provided, to finally pick out the provider you will try out. Once the work is done, perform another walk-through with the supervisor to ensure that all that was promised has been delivered upon. The quality of work should be able to help you decide if you will continue with the provider or try the next best choice you had previously arrived at. Replace that Old Knob and Tube Wiring: You’ll Be Glad You Did! When a friend decided to redo the drywall and plaster of his home, he had no idea that he would find out-dated electrical work. He asked us for some help and we quickly came over to check things out. What our friend showed us was pretty interesting! Somehow the knob and tube wiring had a cool retro look to it, what with its ceramic casings and all, and if it were still in use today it would be known as a throwback to the late 1800s and early 1900s. We would call it obsolete, however, since it is really no longer implemented by any electricians that we know. The knob and tubing appeared to be from the 1920’s. Although there are safety features that are inherent in this type of wiring system, the risks that your old knob and tube wiring pose are not worth the worry. Electricians know this. If you have old knob and tube wiring, not only is there a risk that it is too far deteriorated, but there is also the risk that improper alterations were made over the years after the original installation. 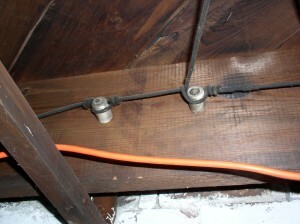 If insulation was placed over the knob and tube wiring, you even have a fire hazard on your hands. It would be best to mitigate such hazards by simply replacing it all. There are several dangers that a home-owner or landlord would be risking if he or she chose not to replace the old knob and tube wiring. The knob and tube wiring system wasn’t originally designed to have a ground conductor and the neutral wire was usually the preferred placement for switches, meaning that only the circuit (and not the current) could be turned off. As much as we enjoy and recommend doing DIY work, we must say that hiring a professional electrician for knob and tube wiring replacement would be a much safer choice. He or she can evaluate the situation from an informed and well-experienced position, and replace the knob and tube wiring without the risk of placing yourself at the brunt of a small explosion! Also, he or she will know the different options available to you, and can choose the one that is more efficient. This is important because one method of replacing knob and tube wiring is by breaking ceilings and walls so that the wires can be run the fastest and shortest route. Tear down jobs may also be necessary to reach higher floors. In considering an electrician familiar with this kind of work, make sure any quote given includes the cost of parts. Such an estimate will consider the price of insulation, along with wall and ceiling replacements. One last thing to consider, is that if the knob and tube wiring has never been updated, it may be a sign that your home or building may have other problems lurking. Get it checked for untreated asbestos insulation! You may also want to have a plumber examine the water pipes – there may be some burst or frozen lead ones. Not only will you want a house with good lighting, you’ll also want it to be safe. Talk to professionals to check your options. Having a well-maintained property means that someone has to keep an eye-out for potential problems. That someone can either be you, your property manager, or (if you want to be efficient!) your tenants themselves. The importance of keeping up maintenance in rental properties cannot be emphasized enough. Tenant maintenance means that you’ll not only have the immediate help from those that are most directly affected by maintenance problems, but you’ll also have your tenant’s appreciation (which is known to be a key for good investment profits). Tenants must know that they are the first-line of defense when it comes to the upkeep of their rental home (and your building!). By making tenants know that they are as much responsible for preventing the deterioration of the premises, you are helping your tenants invest in the idea that their good vigilance and your quick initiative to resolve problems is a mutually beneficial relationship: your home or building is just as much their home or building too. This is a good thing! Your tenants will notify your property management company right away about any issues that come up and they can respond on your behalf. When it comes to good tenant maintenance, the relationship between tenants and landlords is greatly influenced by whomever is running the property’s management. Not all property management companies are the same. It would be advantageous to hire a property management company that holds multiple professional designations. You should especially look for those with a CPM (or Certified Property Manager) designation. CPM members have a Code of Professional Ethics from the Institute of Real Estate Management that they have to follow. Such members also have to have at least five years of good property management experience under their belt. One example is Pyramis Company of San Antonio, Texas. They actually have around thirty years in the business, and they also have the ARM (or Accredited Residential Manager) designation. You may also want to allow your tenants to do minor maintenance for themselves as long as they follow a set of guidelines that you provide. Make it a requirement to have before and after pictures taken. They may be willing to volunteer the labor, if they get a little leeway to choose paint colors or what not, and depending on the rental agreement put in place you can just reimburse them for the supplies. However, when it comes to specialized work, like with bricks and carpentry, or plumbing and electrical fittings, you’ll need someone with experience. But it would be good for tenants to actually see a landlord come out and do something simple, like mend a fence or lay a slab – they’ll get to see how much pride and care you dedicate to their rental home, and it may even inspire them to be more protective of it. Also, if you’re just starting out in the DIY Home Improvement scene, you’ll gain confidence and will gradually be able to deal with increasingly more complex projects as you go along. Getting into the neck of DIY Home Improvement work can be done spontaneously, but you just might have regrets later on. The best thing to do before investing any considerable amount of time or money into a project is to create a plan. Get your favorite writing utensils (and accessories, such as a sharpener and an eraser), writing pads (graph paper and sketch versions), drawing boards (white or chalk), and a clipboard, because these are what make up the nails and hammer of good planning! It is necessary that you have a calculator, a compass, and a ruler, to make precise measurements and drawings. Don’t forget to have on hand some masking tape and a framing square, as those come in handy. A binder and dividers will also go a long way to keep things organized and together. Last but not least, you need your thinking cap – you need to decide what it is you want and what it will take to get there. Honestly, what it takes to get there is for the most part funds! Plans for DIY Home Improvement can be either specific or general, but either way a good plan must keep your budget in mind (and help you stick to it!). Many DIY Home Improvement projects fail in this regard. Don’t make your DIY project another casualty to poor planning. Make your estimates and mark them up by 10% just so that you’ll be prepared for any unforeseen contingencies. Plus, sometimes our expectations don’t reflect the reality that we are after. Regardless, unexpected problems can pop up and mistakes do happen. If they don’t you’ll still have that extra money to maybe add a little adornment to your project that you wouldn’t have been able to do otherwise. In addition to funds and good estimates, timing is important as well. You have to take into consideration the environment of where your home improvement will take place. You probably don’t want to repaint the exterior walls on a rainy day or, if your project is located where it snows part of the year, to replace a roof during the winter. You also have to consider you or your family’s schedule. If you have small children, you have to make sure that they won’t walk into the middle of a hazardous construction zone. Probably the best time is during the summer, where there may be more extra hands available. It is a good idea to always have someone around to help; hopefully, no accident would (knock on wood!) occur, but it would be great to be prepared with someone who can handle a phone, an extinguisher, or simply their hands to help you up and out of what ever you’re dealing with. He or she could also help you go over any checklist of required tools and equipment to initiate your job. Now if you know that you have the funds and the time to get the work done, recheck your incentives. Will it provides benefits now and in the long-run? There is the possibility of a “stylistic depreciation” that you should keep in mind, which means that certain home renovations are actually temporary fads that last about five years. Really think this over because you should want a good ROI and your own satisfaction with what you complete. Will you be changing the color spectrum of your home, rearranging a room, or installing new fixtures? Check out our page on ROI: Get the Best Return On Your Home-Improvement Investment for some things you should really consider in your planning. Having known horror-stories about rental properties that were not well-maintained, we decided to put our fingers to the test and see if we couldn't type up an entertaining and informative DIY Home Improvement blog.